1. In a large soup pot, melt butter over medium heat. Add onions, celery and garlic. Cook and stir until vegetables begin to soften, about 3 minutes. 2. Add broth, potatoes, thyme, poultry seasoning, salt and pepper. Bring to a boil, and then reduce heat to low and simmer, covered, for 10 minutes. Add cream-style corn and peas and carrots. Simmer for 5 more minutes. Stir in chopped chicken and mix well. 3. In a measuring cup, whisk together cream and cornstarch until smooth with no lumps. Add to chicken mixture in pot. Increase heat so the chowder comes to a gentle simmer and begins to thicken. Stir often. Add parsley and serve hot. 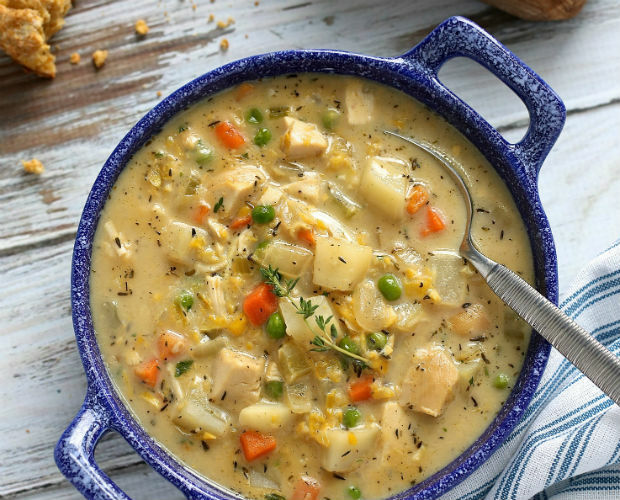 * If it's important to you that the recipe is gluten-free, make sure you use gluten-free chicken broth. ** To lighten up the recipe, use 2% evaporated milk instead of cream. The soup will still be delicious. Recipes and photos courtesy of Greta Podleski’s latest cookbook, Yum and Yummer, on behalf of her new partnership with WW Canada.